October 14th, 2017 saw the first fixture of the Gwent League 2017/18 season. Held in Llandaff, the race was part of the Cardiff Cross Challenge and featured some of the best runners in the country. With it being an important fixture for the club, over 60 members turned out making us a pretty formidable force! For the first time in the club’s history we had Tom Webb representing us in the Under 15’s race and also in the Under 17’s race we had Callum Schofield. Both boys were extremely keen to represent the club and took their races in their stride. 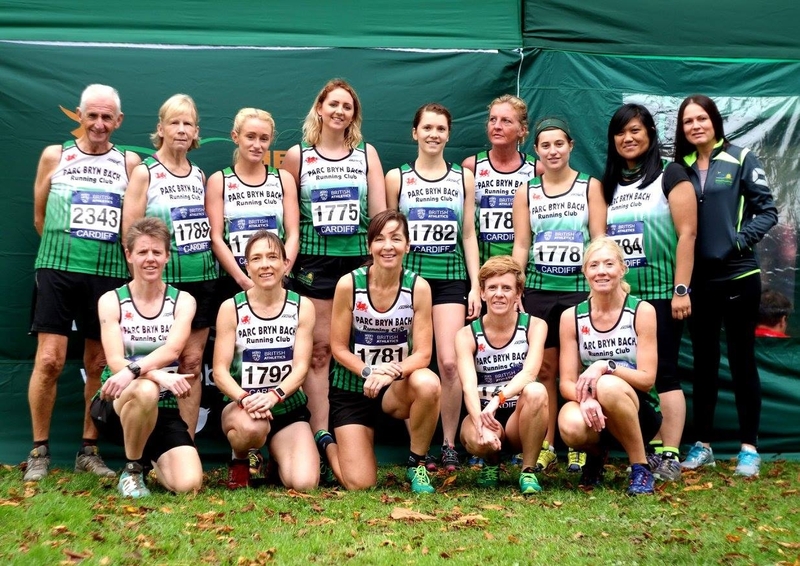 24 women were representing the Green Army along with 2 members running in the over 65’s category. Sharon Woods, Julie Cashell, Lauren Cooper, Sarah Lane Coote, Suzanne Court, Ruth Davies, Rebecca Foley, Claire Sullivan, Hannah Williams, Nicola Jukes, Maricel Jenkins-Belohorska, Sarah Jeremiah, Kath Jervis, Alex Thomas, Delphine Jones, Keri-Lyn Jones, Louise Kirby, Sian McGoldrick, Margrett Monk, Sharon Newell, Melissa Pearce, Emily Sams, Emily Rose Smith, Bobbie Swift, Dai Smout and Michael Lewis. 34 men were representing the Green Army in the last race of the fixture. Lee Aherne, James Ashley, Neil Beynon, Marc Bloomfield, Sam Lewis Jones, Harry Davies, Mathew Ellis, Robert Gale, Sam Jackson, Darren Kippest, Simon Lewis, Tony Lewis, Stephen Mathers, Phillip Miles, Jamie Parry, Gavin Patterson, Lee Phillips, Richard Price, Ethan Sayce, Richard Sheehy, Marcus Smith, James Thomas, Terry Vaughan, Nick Webb, Cyril Williams, Damian Williams, James Williams, Stephen Williams, Gwyn Palfrey, Darren Swift and Sean Thomasson. First up was Callum Schofield in the Under 17’s race and this was the first time that Callum was representing the club in XC. Unfortunately he had been suffering with illness all week but was still keen to run the race. He had to retire at the end of the first lap but still secured a point for the club. Tom Webb was next in the Under 15s and held his own amongst a field of quality runners from England and Wales. Much like the mens race which was taking place later in the day the Senior Women’s race featured quality athletes including Jessica Judd who won the 6.4K race in 19:39, Charlotte Arter of Cardiff AAC and Lily Partridge who was 1st female in the 2017 Cardiff 10K. We were missing a few runners but still had a very strong field and it was Sarah Lane Coote’s and Sharon Wood’s first time representing PBBRC in the Gwent League. The last race of the day and hundreds of runners throughout the day had churned up the ground significantly in parts making it a challenging course. With the winner of the race finishing in 26:28 over a course of approximately 5.4 miles, there were some serious runners amongst the field. That didn’t put off any of our members who were all out to give it their all and try to earn as many points as possible for the club. The women’s team and others who had travelled to support the club were positioned at key spots around the course to offer encouragement where runners need it most. With Sharon Woods now part of the Green Army, we now have two qualified Sports Therapists to fix those aching legs. As usual, the support on the day was second-to-none. With races staggered throughout the day, it was great to see so many members turning up before their race to support the others. With members dotted around key parts of the course, they provided a welcome boost for those feeling the pain. And as always, finishers headed back out onto the course to help push team mates across the line. You know you’re doing cross country right when you’re feeling the pain! Even though the course was largely flat and nowhere near as muddy as the first GLCL XC fixture at PBB, it’s still tough going. At this fixture we were presented with the prestigious Gilbert Legge Memorial Award. The award has been presented to clubs since the second season of the Gwent League and is ‘voted for by the member clubs and it goes to the club which has shown “Sportsmanship, Endeavour and Achievement”‘. With an awesome team behind-the-scenes that ensures everything runs smoothly at events such as the Gwent League, an ever-growing and passionate group of runners and support from family members and our honorary member Steve Jones, receiving an award like this just goes to show how our efforts are being recognised by others.